Christmas at Pine Mountain Settlement School is one of the most memorable times of the year. The holiday is eagerly anticipated by the whole community, particularly the presentation of the NATIVITY PLAY, a community event given in the Chapel at the School. 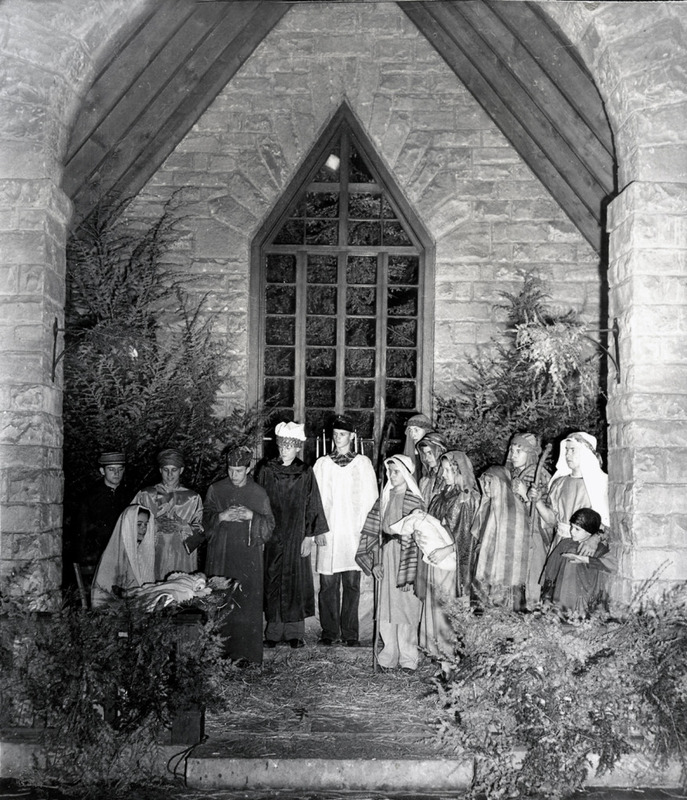 Using a script written by founder Ethel de Long in the second decade of the twentieth century and costumed in mountain homespun and decorated with boughs of hemlock and pine from the nearby mountain, the solemn NATIVITY PLAY is a simple and direct telling of the birth of Christ punctuated by Christmas carols and ballads. Within the setting of the small Chapel, the event is intimate and quietly inspirational. Once seen, few forget the experience, but many still remember an earlier time during the Boarding School years when the events leading up to Christmas filled most of the month of December. Photographs and descriptions of early Christmas celebrations including the NATIVITY PLAY are scattered throughout the records of the School. Many of the events were photographed or described by staff and students who shared in the holiday events. Links to those accounts follow. 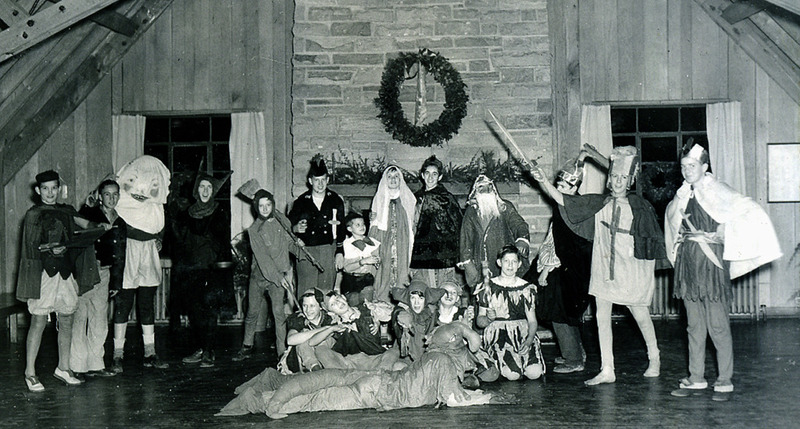 The Nativity Play has persisted, but with the closure of the boarding school many of the other events that took place over the years during the Christmas season have largely fallen away. Yet, echoes of those celebrations can be found in the School records. For example, when the boarding school was in operation a series of sequential events during December were planned by the full staff and students and were joined by many in the nearby community. 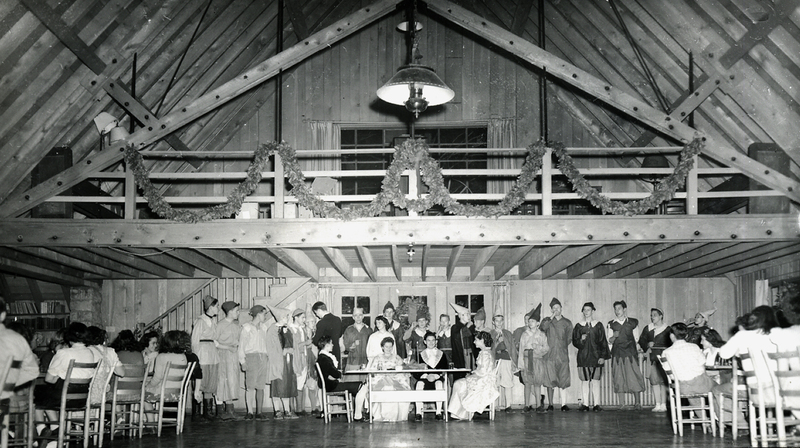 Beginning with Caroling and the Christmas Candle-Lighting ceremony of the girls and followed by the formal ceremony of Bringing in the Yule Log by the boys, the expectations of Christmas Day grew on campus and in the valley until the final Christmas Party and the arrival of Santa Claus. The most jubilant celebration during this period was the Mummer’s Play, an adaptation of ancient Celtic rituals and dance and a chance for the thespian to shine. These and other traditional events were enjoined in varying sequence through the years but, remarkably, the program varied little in its practice for most of the years that students were in residence at the School. 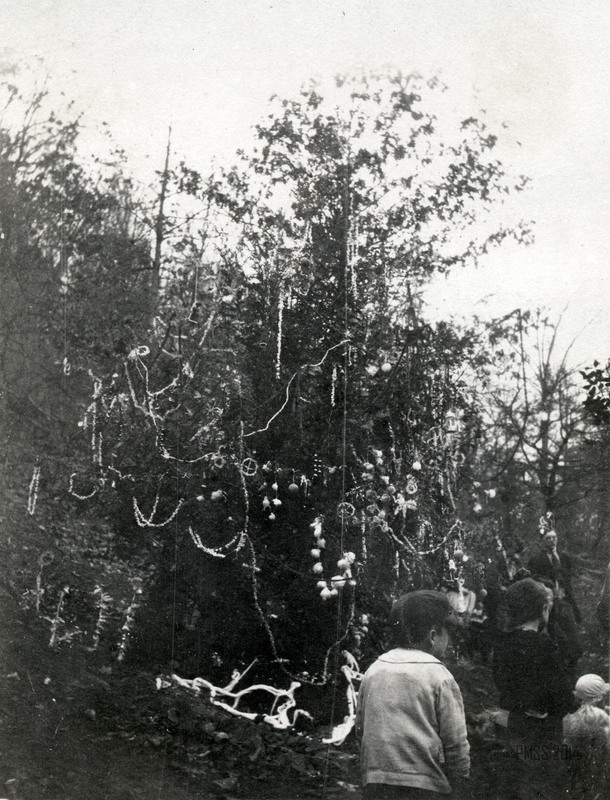 The accounts of Christmas celebrations were recorded by many staff, students, the Pine Cone and Conifer newsletters, and other sources, now found in the School archive. For example, a published account by Katherine B. Wright, “Glimpses of a Pine Mountain Christmas, 1921” is one of the more descriptive early accounts, but, then, most staff narratives describe the season in detail. Many narratives like to contrast the ceremonial nature of the events on campus with the more informal activity in the surrounding community. 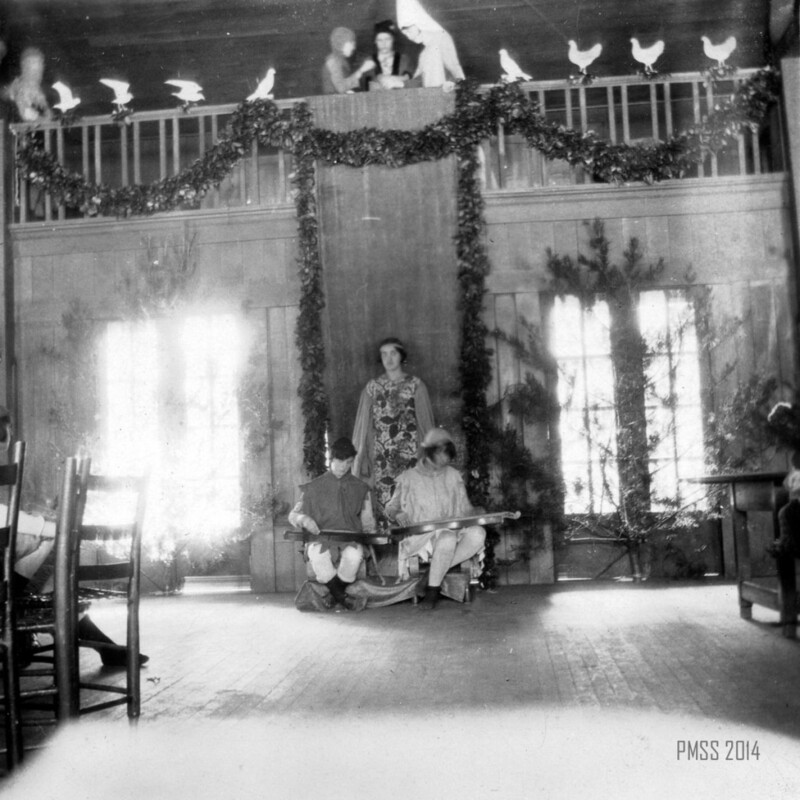 Christmas on the north side of Pine Mountain was not always filled with the many traditional rituals adopted by the School. Before the School was established, Christmas in the valley was rarely observed in a ritualistic manner in the family homes. More often, it was a time to drink a little and shoot off guns in celebration of the season. Gifts, if given, were often simple and few. However, by the 1920s there were independent celebrations in the small schools and communities surrounding Pine Mountain Settlement School and most families had adopted the traditional rituals of the season. 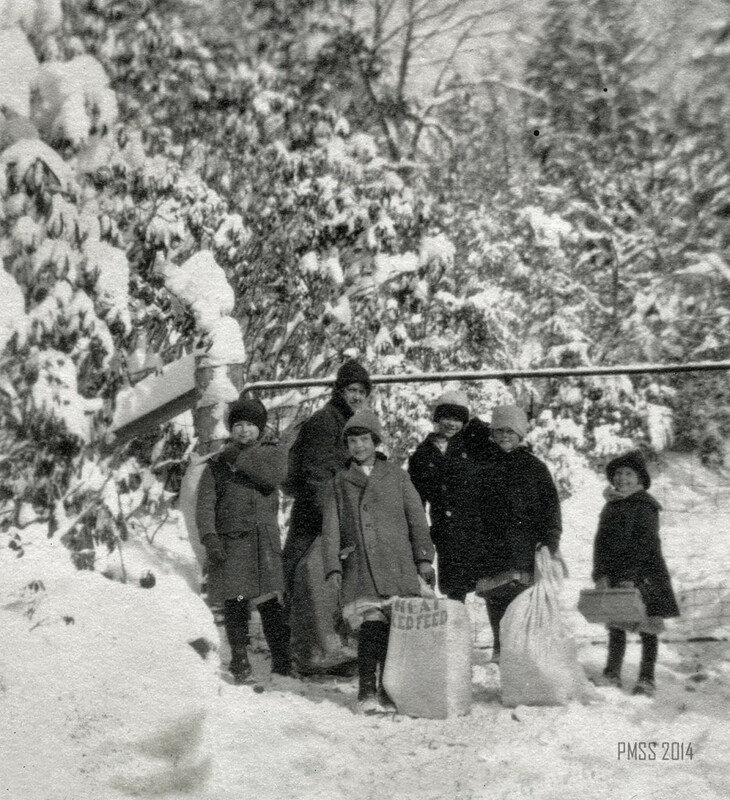 In a Dear Friend Letter of 1914 a writer, probably Ethel de Long, describes the second Christmas at the School — CHRISTMAS AT PINE MOUNTAIN 1915. Her intimate look at Christmas with the small children at the School in the opening years is fresh and touching. Her narrative captures the special importance that community members began to attach to the season following their introduction to the Pine Mountain Settlement School Christmas season. When a woman neighbor came to the second celebration of Christmas at the School wearing a few silver strands of tinsel she had saved from the first Christmas tree the year before, the importance of the new community event was clearly signaled. During the first decade, the response to Christmas across the community was an evolution. It combined elements of imported rituals and local customs and balladry, and by the boarding school years many of the early rituals were firmly mingled and established with conventional expectations. The evolution was not difficult, from all appearances, for both the School and the larger community, the celebrations evoked and integrated the heritage of many of the people. The “fotched-on” programs of the School were not far removed from the ancient roots and religion of many of the families in the valley. Elements of some of the ancient Christmas rituals had persisted in the minds of those who participated in the settlement school celebrations. Even today the echoes of English and Scots-Irish origins in the various celebrations resonate with many families associated with the school, Whether those echoes are from association with the School or were resurrected from family traditions, is sometimes difficult to tell. Genealogy and family heritage customs were retained down through generations in many families in the area and today the search for roots is of growing importance and interest to the families. My first Christmas at Pine Mountain opened my eyes to what the holiday meant. For several weeks the entire school – students, workers, and school maintenance workers – prepared for the holiday. The buildings, especially inside, were decked in ivy and garlands of greens – fir, hemlock and pine. The scent was enlivening. The anticipation of participating in scheduled events, plus the forthcoming two-week break spent at home, produced an air of excitement. The main event on the campus for the Christmas season was the Nativity play and all anxiously awaited the selection of the person to play Mary, Mother of Jesus. It was the most prestigious part and vied for by all the girls on campus. Being chosen for the part of Mary entailed a combination of popularity, student vote, grade average, and teacher scrutiny – truly a meticulous way, but the right way, to pay honor to the part. Source: Angel, August D. Trivia & Me. London, KY: August David Angel, 2007: 85. Print. 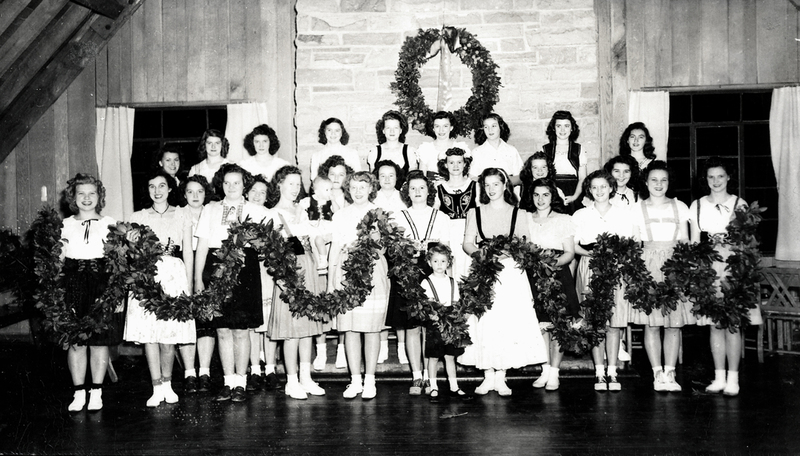 This guide to Christmas at Pine Mountain Settlement School also traces later traditions that were added or dropped from the school’s activities. By the 1940s the basic traditions were established and several new additions to the ceremonies were added by director Glyn Morris. Influenced by his Welch upbringing, Morris introduced activities that were reminiscent of “A Child’s Christmas in Wales,” the classic story by Dylan Thomas. This is suggestive of far-reaching influence of schools like Pine Mountain which, through the years, has tried to foster the Christmas spirit. Our preparation for Christmas began at Thanksgiving time for rehearsals of carols, decoration of houses, and above all – the work on the Nativity Play, the cultural feature of the week preceding Christmas vacation. Nearly every day in the free hour of pupils, a group can be seen bound for the woods: Gaily going out carrying empty sacks or baskets and returning, laughing, singing – well laden with every variety of green from the woods of a [neighbor?]. Then the making of wreaths and garlands begins. Busy days follow until at last everything is in readiness for Open House – (Sunday afternoon when everyone goes calling on different houses to view various types of decoration.) It is amazing to see how much can be done with little insignificant things! A cheery welcome awaits the visit in each house with a hearth fire, candlelight, and festive fragrant surroundings. After supper, a group of children dress in gay red capes with hoods and enter singing, “God Rest Ye Merry Gentlemen.” They each carry strings of woodsy things, which they’ve gathered and strung and, singing as they go from table to table, they trim the small Christmas trees. An example of trim reveals the ingenuity of the mountain child in using what he can find about him. All sorts of seed pods, sycamore balls, witch hazel, red berries, blueberries, tiny [ros.?] fungus, even popcorn – in short, anything that can be used. Tuesday evening, after we have gathered around the table, we hear voices from the distance singing the old English carol, “The Holly and the Ivy.” About 20 girls appear on the balcony which extends around three sides of the dining room. As they reach a certain point of the carol, they lift over the railing of the balcony a garland of laurel which they have made. May I remind you that mountain people call laurel, “ivy,” as described in England years ago. This carol…[page 3]…has a special significance in the dining hall called Laurel House. At the conclusion of supper, the girls from another house, dressed in medieval costumes, assemble on the balcony and sing, “The Twelve Days of Christmas,” which proves to be a very colorful and interesting drama when all the little wooden figures mentioned in the carol appear on the balcony rail. On Wednesday at the School we have a special Christmas assembly with scripture read, carols sung, a drama of “Good King Wenceslas” and “Here We Come a-Wassailing.” The children always love this assembly. On Thursday evening after supper we have a Mummers play and old Father Christmas comes bringing oranges and some simple gift for each child. Friday evening is the climax of the week. After supper all wend our way through the quiet starry (or snowy) night to the little stone chapel where a scene of simple beauty greets us: A great towering hemlock against a gray [st.?] background and a rustic manger scene before the altar, seen in dim eerie light. It is almost breathtaking as they suggest unmistakably the setting for the Christmas story which is enacted slowly and reverently. It was my privilege to coach this play… [THE NATIVITY PLAY] [page 4]…each year and I never failed to get a catch in my throat as I heard the prophets, shepherds, and kings speak lines, and Mary sing [ex.?] the Coventry Carol – “Lullay Thou Little Tiny Child.” After the candles of [a] seven [branch] candlestick are lighted during the singing of “Adeste Fideles,” the school children and workers go quietly forward and leave at the foot of the manger some little gift which can be used when Christmas is carried into the faraway hollers and hills to children and grownups who would otherwise have no Christmas. Thus, I think you can see that Christmas Week is a time of really getting ready for Christmas. It was an opportunity of showing mountain boys and girls (who inherit a definite culture from England) some of the beautiful customs of old England, adapted somewhat to suit their rustic environment. It was a beautiful time, a gay time, a time of laughter and an occasional furtive tear, a time of goodly fellowship, a time for simple thoughtful giving. Can you wonder that the memory of it is deep in my heart? Today at the School the most important of these celebrations of the Christmas season is the community performance of the NATIVITY PLAY. The hemlock boughs have thinned out surrounding the Chapel, as the aphid hemlock woolly adelgide has taken a toll on the trees in the Southern Appalachians, and galax is nearly impossible to find or to disturb, but other greenery has been substituted and the event has been little changed from its original presentation. 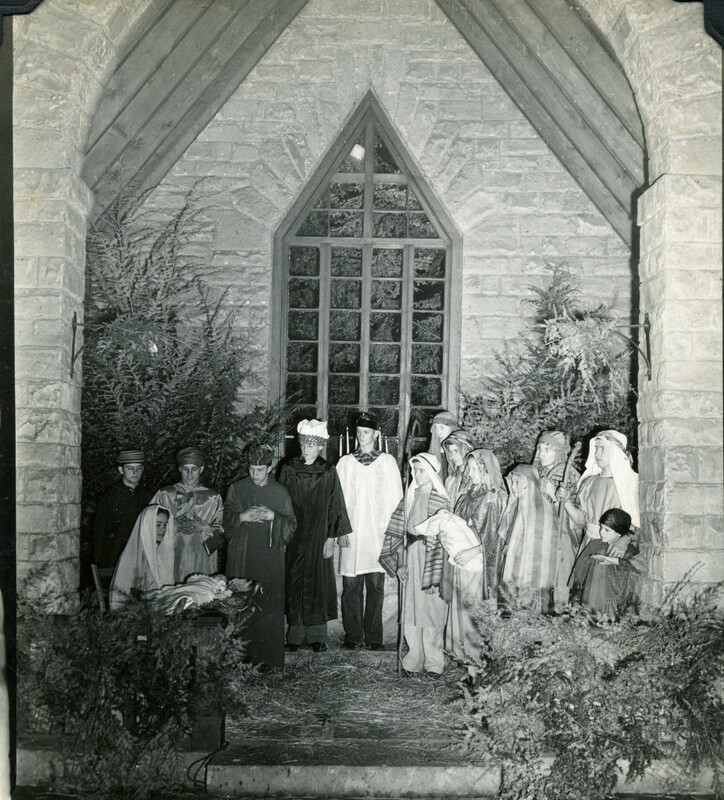 CHECK THE PINE MOUNTAIN SETTLEMENT SCHOOL CALENDAR FOR DATES AND TIMES OF THE NEXT NATIVITY PLAY. Today, in the weeks leading up to Christmas, various other small community events continue to take place arranged by Pine Mountain’s Community Outreach Coordinator, Judy Lewis, who is a native of the Pine Mountain valley. She has generously given of her time and energy to provide activities for the families of the community during this Holiday season for many years. She also coaches the community children and adults in the narrative of the Nativity Play and passes along the traditions first learned under the guidance of Mary Rogers who directed the Nativity Play activities for over twenty years. The Nativity Play, which now has two performances, attracts an overflow crowd in the Chapel several weeks before Christmas Day. 1920 NOTES – Description of a Pine Mountain Christmas, March 1920 issue, pages 1-2.